I tend to think that I am not as addicted to technology as some since my phone doesn’t have web service, but documenting how much I use technology in a day has me thinking otherwise. I may not be on my phone as much as some but I think that I make up for that with how much time I’m on my computer. I call and text occasionally, and stay somewhat connected on Facebook and Twitter. I love reading the news so I spend a lot of time on my computer searching through the internet. Today I had a few classes and took notes by hand for half of them–although I would have used my computer for all of them had I had enough battery. On my way to class I listened to music on my iPod Touch, which I recently found under a seat cushion at my house over Thanksgiving break. I also used some of the hardware that I talked about in my remix production practicum. Realizing how much I depend on technology is kind of baffling considering were still in the early years of the internet. All things considered, I think its kind of unique that this generation has all these advanced gadgets at their fingertips while previous generations could not have imagined it. Stepping back from it all, I’m glad that technology makes things easier for me, but its also kind of strange to consider that we are really living in a time where technology has the ability to placate people and distract them from reality. The biggest difference between Hulu and Youtube is the content. The look and feel of both sites say a lot about what kind of content they put forward. 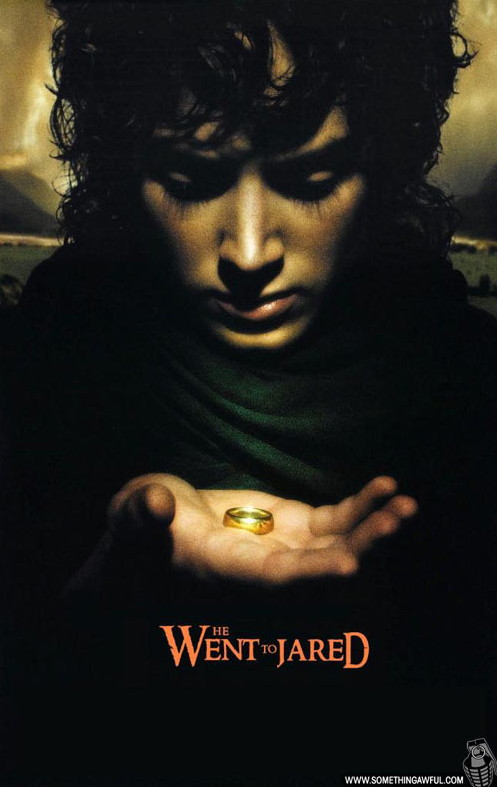 Hulu has a much more corporate look with a lot of popular TV shows being advertised on the front page. The search bar automatically reveals the shows that Hulu has as you type in a search and the Hulu website basically guides you to where you need to be. Youtube on the other hand is much more user-controlled and less hierarchical. Because there are so many videos of random things on Youtube, it is easy to get lost. Youtube has done a good job linking similar videos together with its playlist feature. Hulu has a more professional layout (the site is actually very similar to HBO’s) because of the professionally produced content that it offers. Youtube is more of a place for amateurs to share videos although it is becoming increasingly filled with commercial advertisements. I think these two approaches to essentially the same service shows how content drives design. It has been a rough venture to try and mashup a video and set it to music. For the presentation I will have 2 video mashups. The first I detailed earlier and will be sampled from MarioKart 64 gameplay. 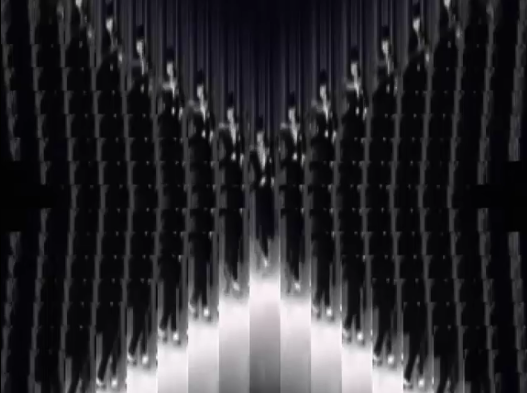 For the second mashup I took a video of Fred Astaire tap dancing to “Puttin on the Ritz” and combined it with some music. This number was included in the 1946 movie “Blue Skies” which starred Fred Astaire, Bing Crosby and Joan Caulfield. I will have the links to the full videos on vimeo in my post before my presentation. 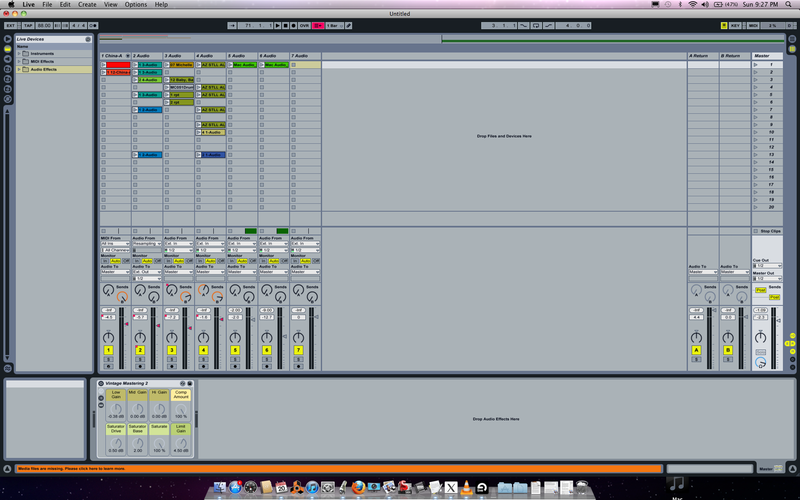 I am going to try and talk about sequencing the video and music in the program Ableton Live. First, I drag the video into a track in Ableton. The program automatically registers the BPM of the song based on the soundwaves that are dragged in. I add in a drum track to play along with the video and match up the rhythm of the drums to the rhythm of the dancing. Once everything was on beat, I tried out a bunch of different effects on different video loops. Organizing everything takes a good while and I included a picture of what everything looks like in the program. The video track is at the top and everything else underneath it is audio. There is also a video box that shows what is being played. I included a mashed up picture and a .gif. I made the .gif using GIFQuickMaker (which is free in the app store if you have a Mac). It was actually pretty easy to make with GIFQuickMaker. You can drag and drop any photos you want. 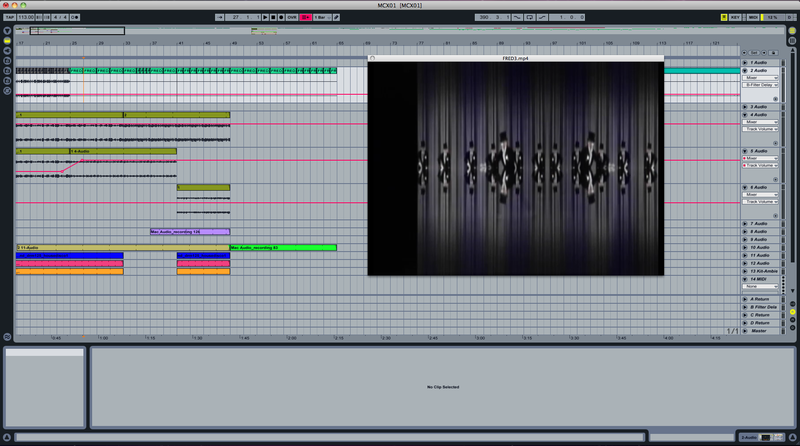 I screen captured the ones I wanted from Ableton and then dragged them in and clicked create. I don’t think that I could or should really be able to sell things like these. That being said, I also don’t see the problem in being able to spread simple mashups like this for free or for educational purposes. For this post I remixed a song that I posted on my Soundcloud. For the remix I used part of the Beatles song “Michelle” and the AZ song “Still Alive.” The sample from Michelle is about 25 seconds into the song when Paul sings “Sont des mots qui vont très bien ensemble” which means “these are words that go together well”. AZ is a rapper from Brooklyn who first appeared on the Nas album “Illmatic”. The song “Still Alive” is from AZ’s 2005 album A.W.O.L but I only used 2 out of 3 verses from the song. I don’t think there is any problem in posting a remix of this song for free (not like my Soundcloud gets a ton of views). The rights to use Beatles songs are expensive to get so I obviously could not distribute this for money. Remixes being posted for free like this have become so prevalent with the rise of the internet and increasing availability of software and hardware to mix that and I don’t really see the threat that they pose to artists. The ability to make mixes like this has definitely been curtailed by copyright law and I think basically restricts a form of creative expression.